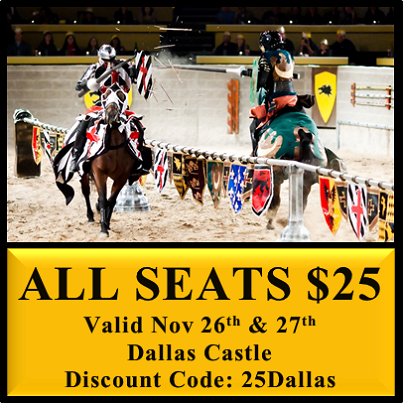 Medieval Times Dallas Castle All Seats $25 (11/26-11/27)! If you have some time off work this week and want to do something with the kids, here is a great deat at Medieval Times and Tournament Dallas Castle. Previous postHOT! Call of Duty Ghosts: X-Box One, X-Box 360, Playstation 3 & Playstation 4 $39.99 Shipped! Next postFREE Baby Sling from Seven Slings ~ Over $40 Value!